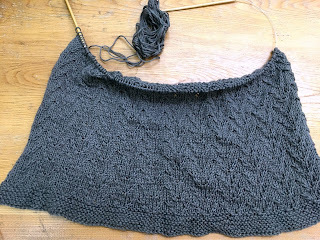 I didn't get quite as much knitting done this weekend as I'd planned, but I'm halfway through the front of this top now, and everything still seems to be going smoothly. I did discover an issue with the pattern for the final top in this collection, and I'll have to work that out this week, but otherwise things are going swimmingly. I haven't started my OAL projects at all except to prewash my fabric and wind my yarn, so I'd really like to get the collection knitting done by mid-July so I have a chance of at least getting started with my OAL projects! The baseball game on Friday night was terrific fun. We had great seats, and apparently a lot of people walking by were intrigued by my knitting. Saturday was a lot of cleaning, and yesterday I made Thai cashew chicken and had some one-on-one time with the community theater director to work on my characterization and monologues. That time was really invaluable and helpful, and I'm feeling a lot better about what I'm doing and what directions I can take things. This week looks like another busy one- we're starting to run whole acts this week in rehearsal, which I find really helpful and love doing, but it means some long nights. The state gave us Monday off as well as Tuesday, so I've got a four-day weekend to look forward to. I don't know if we're going to go do anything for the Fourth yet, but I'm definitely looking forward to some relaxation time. Progress Along, good title for summer knitting. Your knitting pattern and colour is fantastic. Looks like great progress!! I feel like now that I'm knitting again, it's super sloooooow.